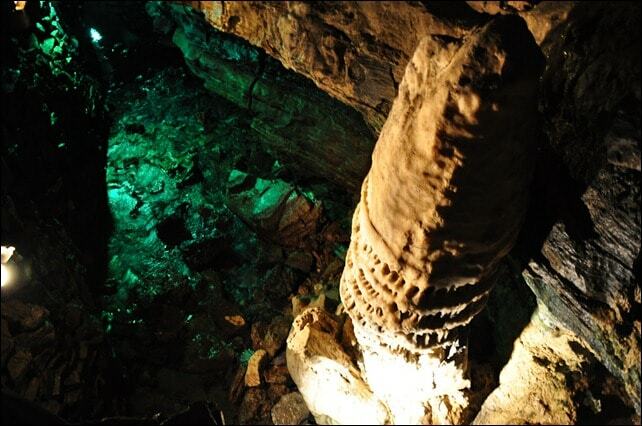 It’s lonely to be a guide at Howe Caverns on Valentine’s Day. While couples smooch on the Lake of Venus boat ride, valiant tour operators soldier on to share a wealth of geological facts. And they do more than just deliver facts, the young guides make the tours entertaining too. A visit to Howe Caverns with kids is a thrilling journey. Those daring enough to be there when they switch off the lights will experience a world like no other – chilly, creepy, and more than a little disorienting. 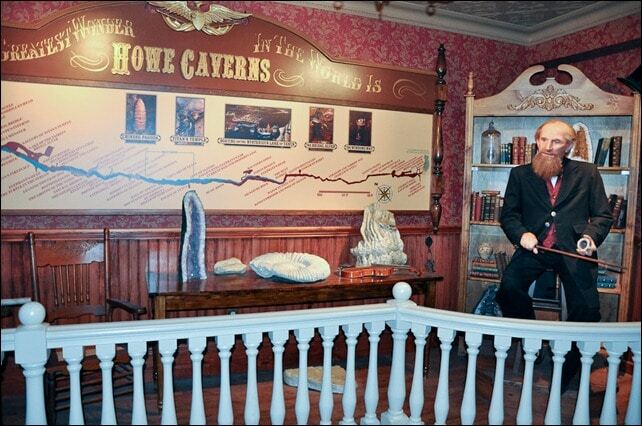 Legend has it that in the early 1840s farmer Lester Howe’s cow, Millicent, found the entrance to the cave. 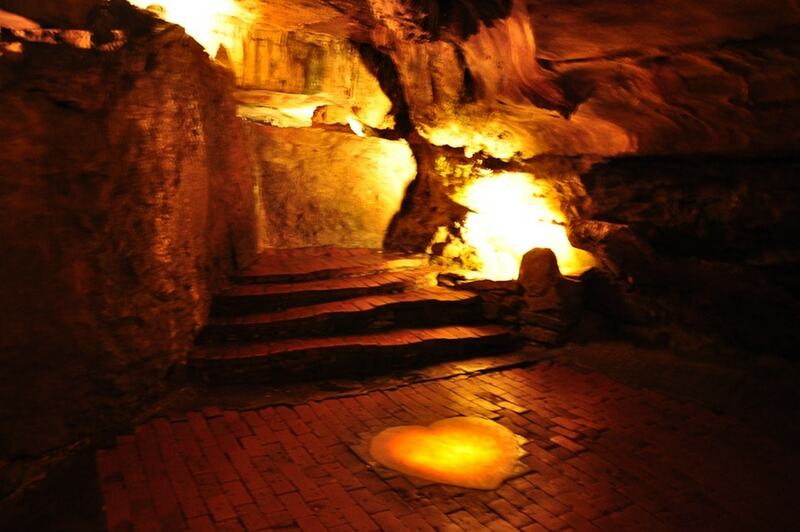 A year later, Lester opened Howe Caverns to the public. But it was not until 1929 that a new entrance was created, accessible via elevator, along with the paved paths, brick walkways, lighting and handrails still found today. Since then, Howe Caverns has seen a number of owners and renovations, but none as exciting as those taking place right now. One of the new additions, an animatronic figure of Lester Howe, greets visitors headed to the elevator that will carry them down 156 feet below the Earth’s surface. Inside the caverns, the traditional tour hasn’t changed much; it’s much the same as I remember from multiple school tours in years past. A tour guide leads you past many staggering calcite formations, millions of years in the making, beckoning wandering hands. Stalagmite or stalactite? A tricky question when some formations have shifted over time. 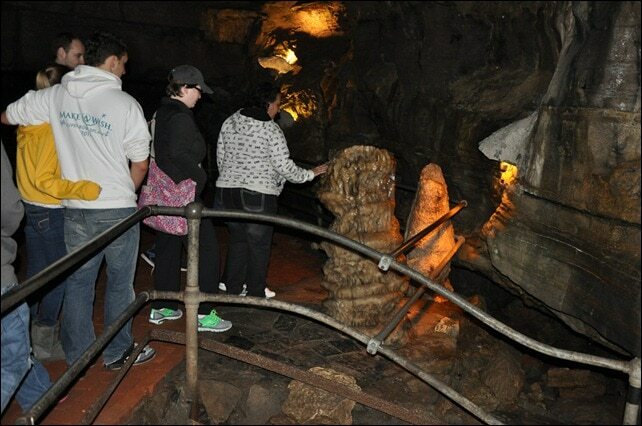 Wisely, visitors are allowed to touch one stalagmite, hopefully getting it out of their system. If not, they are reminded of the Caver’s Motto: Take nothing but pictures, leave nothing but footprints, kill nothing but time. And the group is kept moving, covering a mile of walkway on the hour-long tour, stopping only for a short boat ride along the Lake of Venus. In seventy years, the tours have been smoothed and polished so now visitors are kept well entertained with amusing anecdotes, trivia, and the occasional joke. Spoiler Alert: several amazing natural features of Howe Caverns can be seen in this video tour of the caves. One of the more dramatic stops on the cavern tour is at the Bridal Alter, site of more than 600 weddings a year. The first wedding took place in 1854, when Lester Howe planned the publicity stunt that would see first one, and then later another, daughter married. Today, the superstitious stand on the calcite heart to discover if the fates promise love in the coming year, or a baby for those already wed.
Hopefully, neither for my young daughter. 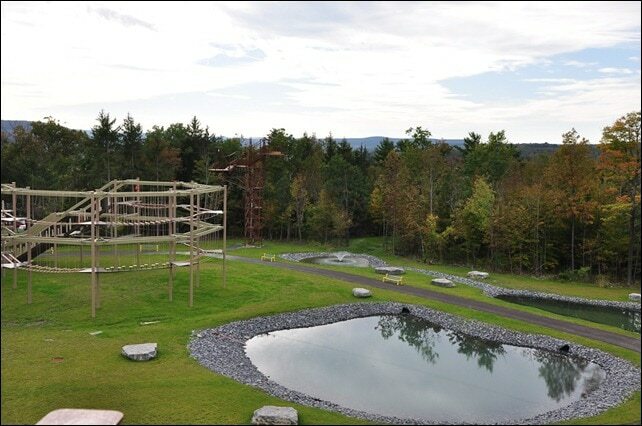 Four-Tower Zip Line is 950 feet long, and stands high above the earth. This scenic aerial ride is divided into four sections and takes riders for a beautiful view suspended up to 40 feet in the air. 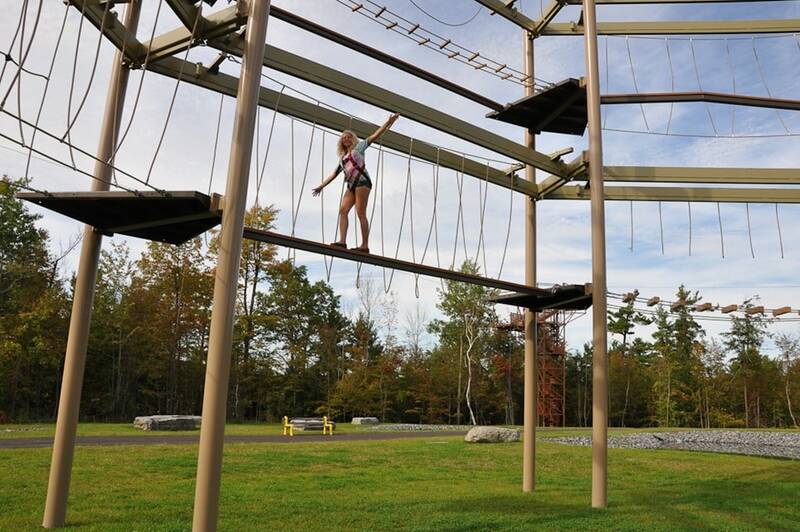 The Sky Trail® Ropes Course lets visitors go through a series of surprising and increasing challenging activities. Suitable for all ages. 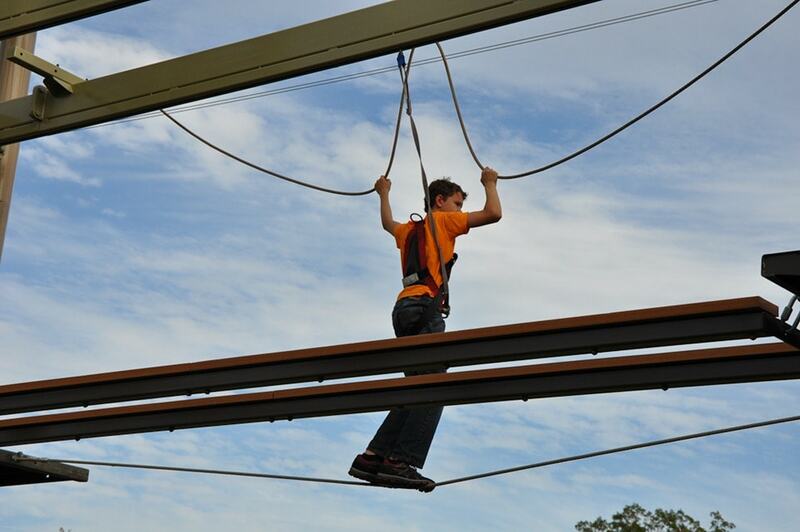 Truthfully, the ropes course and zip line were a little tame for my thrill-seeking teen and tween. 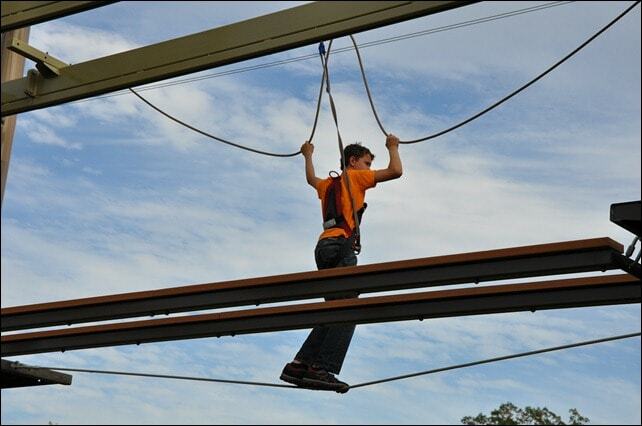 We’ve conquered some of the tallest, steepest, longest zip lines and extreme ropes courses available. And this was not it. What it is; however, is a great place to introduce adventure courses to younger children or to adults who are afraid of heights. And even though Howe High Adventure was not especially thrilling for us, the views it afforded cannot be beat. I think I’m just coming to the conclusion that you guys like creepy places. 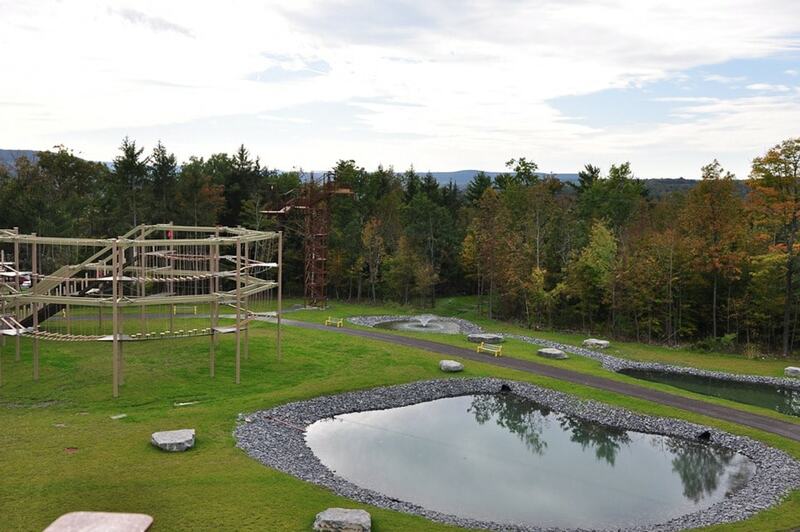 Gotta say caves aren’t my thing, but the ropes course, for those of us who aren’t ready to start at the top of the treeline, looks like a lot of fun!